As part of my undergraduate work at RIT, I took a course called Internetworking. While the classroom portion went into the guts of physical media specifications and computer networking, the lab component was by far more fun. We learned how to configure Cisco routers and switches. We learned how to do packet captures. We learned how to punch down CAT-5 cable into T110 blocks. We learned how to pull cable through overhead trays using service loops. We learned how to pull cable vertically through walls. These hands-on experiences were an invaluable part of my education and have proved a solid base for me at work and home. Students still have to punch down both T110 blocks and wall jacks, but now they have to pull through conduit as well. 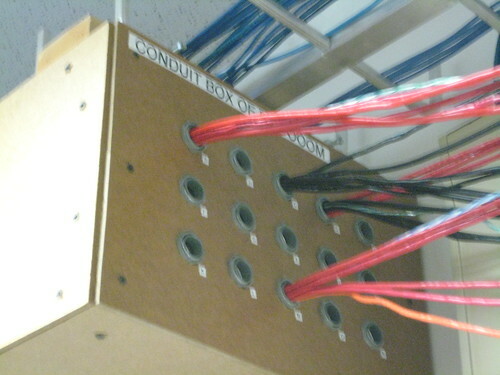 The conduit box (of doom) they use is far from straight through; inside the box, the EMT bends and forks in variable ways and some inputs may not have valid outputs at all. Though simple, the thing can simulate any number of problems when pulling through broken or blocked conduit. While fiber termination and shielded cable work still isn’t on the menu due to costs, the networking courses at RIT have improved since I graduated. There’s now a course called Network Troubleshooting, taught by one of my favorite professors. 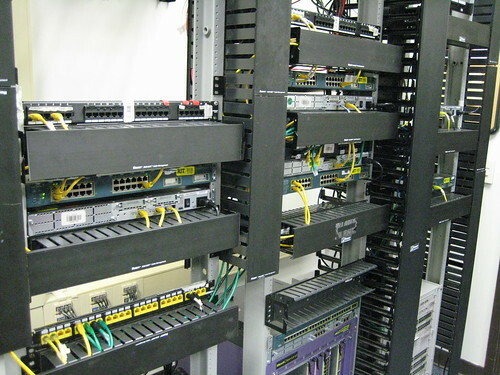 The labs are well-stocked, full of rack-mounted gear suitable for simulating any number of conditions. I got to observe one of these exercises the week I was up for the Career Fair. One group of students is required to stand up a faux-ISP. Their goal is to provide Internet access to another group (who simulate the end users). They are provided a serial uplink in a different rack that simulates their upstream bandwidth provider, but otherwise they must bridge the gap to provide service to the other group. 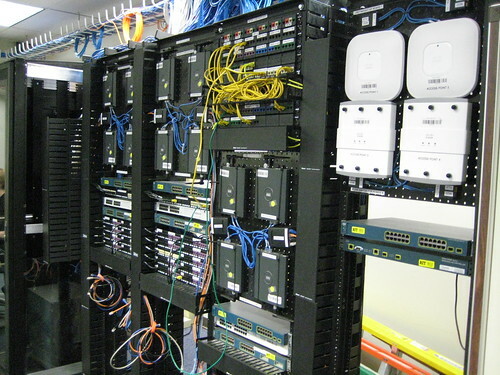 Their network encompasses different physical media (wall jacks, T110 blocks, conduit), devices (switches, wireless APs, routers), and services (DHCP, DNS). All physical and network configuration must be documented in a site book. Once it’s all working and verified, the lab managers and professors come in one night and break things; loose leads, sliced cabled, bad power cables, anything is possible. The exam involves a set period of time where the students have to find the problem and correct it. Pretty neat idea. The course also addresses programmatic issues that practitioners should be aware of. Budgetary overruns, lack of access, conflicting requirements, etc. The brief lecture that I sat in on sounded all too familiar. I wish such a course had been around when I was there.